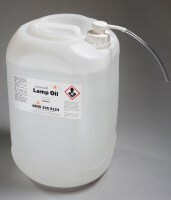 From £2.76 per litre our clean burning, sootless and odourless lamp oil is supplied in either 25 ltr drums or cases of 1 ltr bottles and is available in any colour. We have ten standard colours to choose from. The drums are supplied with a free pump and filling system, while the litre bottles come with a filler nozzle.